The Baltimore housing market is seeing surging prices, fewer days on the market and plenty of new listings, according to MRIS. 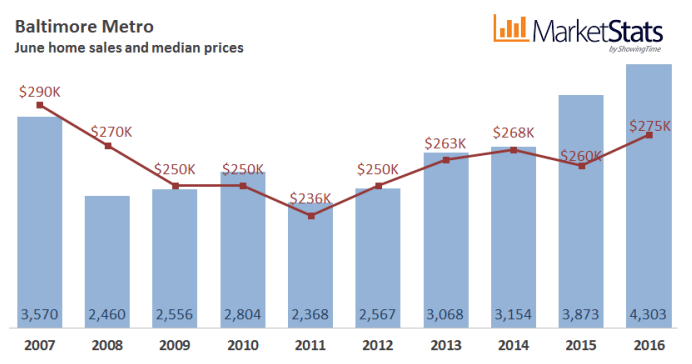 Its Baltimore housing market report said June’s median sales price of $275,000 represented a 5.8 percent year-over-year increase and 5 percent month-over-month rise — the highest median price of any June since before the recession. MRIS data also showed the Washington D.C. metro area’s sales volume in June climbed 7.9 percent year-over-year to $3.2 billion, which is 14.1 percent higher than the previous month. This is the 19th month in a row of year-over-year increases in closed sales. A study by CareerTrends showed the highest cost of living for single parents raising two kids lies in Washington D.C., with a monthly expense of $8,669. The annual cost of living in D.C. is $104,027 — far beyond median income, which is just under $70,000, according to U.S. Census findings from 2010-2014. This leaves many single parents under the line for providing the absolute necessities, let alone savings.